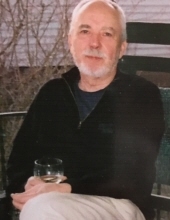 Gary J. Galles, 77, of Remsen, IA, died Sunday, Feb. 24, 2019 at Happy Siesta Health Care Center in Remsen, IA surrounded by his children. Mass of Christian Burial will be 10:30 a.m., Friday, March 1, 2019 at St. Catherine’s Catholic Church in Oyens, IA with Father William McCarthy officiating and Father Andrew Galles concelebrating. Burial will be at St. Mary’s Cemetery in Remsen, IA. Visitation with family present will be 4-7 p.m. Thursday. There will be a parish rosary and vigil prayer service all at 5 p.m. at Fisch Funeral Home & Monument in Remsen. Visitation will resume from 9-10 a.m at the funeral home on Friday. Gary was born April 2, 1941 LeMars, IA, the son of Jude & Bernice (Plathe) Galles. He was raised in Remsen and received his education at St. Mary’s School in Remsen. He graduated from St. Mary’s High School in 1959. Gary was a member of St. Mary’s Catholic Church in Remsen. He enjoyed reading, gardening and current events. Survivors include his three children, Shawn (Kathy) Galles of Council Bluffs, IA, Shannon (Mike) Scarbrough of Gilbert, AZ, David (Anne) Galles of Gretna, NE; 6 grandchildren, 1 great-grandchild; five siblings, Pat Merrick of Omaha, NE, Dale Galles of Cherokee, IA, Darrel (Chris) Galles of St. Augustine, FL, Tim Galles (Donna Conaway) of Marcus, IA and Christy (Steve) Pick of Remsen, IA; and many nephews and a niece. He was preceded in death by his parents Jude & Bernie Galles and one sister JoAnn (Robert) Joyce. Casket bearers will be Phillip and Louis Pick, Ben and Dan Galles, Barry Joyce and Tom Ahlers. In lieu of flowers the family would like memorial donations in Gary’s name to the either. To send flowers or a remembrance gift to the family of Gary John Galles, please visit our Tribute Store. Visitation with family present will be 4-7 p.m. Thursday. There will be a parish rosary and vigil prayer service all at 5 p.m. at Fisch Funeral Home & Monument in Remsen. Visitation will resume from 9-10 a.m at the funeral home on Friday. "Email Address" would like to share the life celebration of Gary John Galles. Click on the "link" to go to share a favorite memory or leave a condolence message for the family.